1. Preheat the oven to 220°C, gas mark 7. Prick the skin of the duck all over with a skewer and pat dry with kitchen paper. Heat up a non-stick frying pan skin and cook the duck breasts skin side down for 4-5 minutes then place the duck breasts skin side up in a small roasting tin. Mix 1 tbsp orange juice with the sugar and 1 tbsp of the soy sauce and brush over the skin of the duck. Roast in the oven until the skin is crisp and golden, basting occasionally with any pan juices; cook for 20 minutes, or until cooked through. Rest for 5-10 minutes in a warm place. 2. While the duck is cooking, steam the broccoli for 3-4 minutes until just tender then cut into 3-4 cm lengths. Heat the oil in a small pan and add the ginger, chilli and garlic. Stir for a minute then add the lentils and cooked broccoli. Stir though the remaining orange juice and soy sauce with a teaspoon of the grated orange zest and heat through until piping hot. 3. 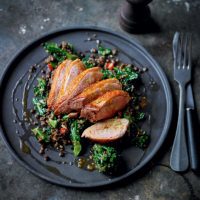 Slice the duck and arrange on warmed serving plates and pile the lentil and broccoli mix on the side. Drizzle over any remaining duck pan juices. Serve.